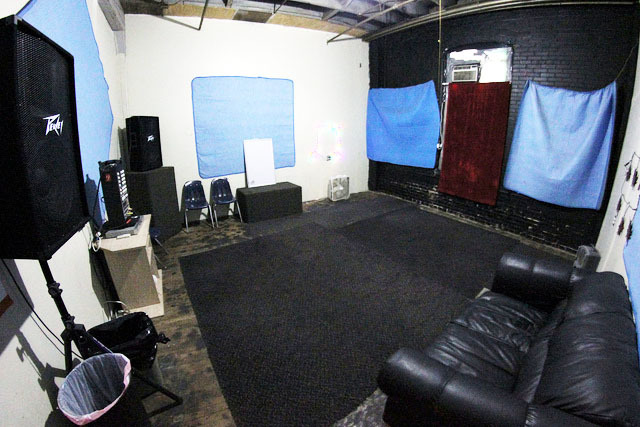 $15/hour 18'x18' rooms, Studios 1-4. $17/hour 34'x18' & 26'x18' rooms, Studios 5 & 0. $30/hour Lounge, up to 20 guests for photo/film shoots. Band Membership: $175/month. Includes free storage and unlimited access 6pm-2am daily. Solo Membership: $50/month. Unlimited access 6pm-2am, discounted storage ($25) and guest rate ($5/hour per guest). PRIVATE ROOMS $150-$350/month. 18'x18' rooms rent for $275 down and same per month with 1-year lease. Other sizes amd terms available. Start a membership any day of the month and you're covered for the next 30 days. If you have a set practice schedule, give it to us and we'll guarantee all your timeslots in advance. If you don't have a set schedule that's ok; you can also book time as you go along. If you have a preferred room that you like best, let us know and we'll try to keep you booked in there as much as possible, but if you require a specific room guarantee (like the dance studio), add $2/hour. When you are not rehearsing, you can store your gear here in a lockup. SOLO MEMBERSHIP - Allows a SOLOIST or PHOTOGRAPHER unlimited access daily 6pm-2am, plus discounts on guests and storage. Storage for your gear is HALF PRICE (an additional $25) with a Solo Membership. If you like to jam with a friend or two, but aren't ready to form a band--your guest can get his/her own solo membership, or pay a reduced hourly rate of $5/hour per person. Photographers can get a solo membership for themselves, and pay $5/hour per model. Or, they can also purchase an additional $50 Guest membership to use for models. Load into a studio (subject to availability) and leave your own gear set up for a few days consecutively. The room is accessed by only your band for the duration of your block, and remains locked when you are away. Access anytime during regular studio hours. No deposit required. Each main hall studio has hardwood floor and 12'-14' exposed wood joist ceilings. The rehearsal rooms are designed as live studios to give a decent impression of what you will actually sound like live--not acoustically dead like a recording room, but with sound-deadening applications to prevent you from being distracted by the band next to you (staggered beam construction, no vents, double sheetrock, double-insulation), plus acoustic treatments (foam, baffles, acoustic paint) to absorb excess frequency vibrations. Each studio has 12 grounded outlets and its own a/c unit and heater, so you control the temp without bleed over through vents. We make no guarantees regarding soundproofing; expectations vary greatly from band to band. If we know you are self-recording, we will isolate you as much as possible from other bands. Every main hall studio comes equipped with a vocal PA & 2 mics/cables, is air-conditioned and acoustically treated. Hourly rates are $15. Or, $175 gets your whole band unlimited practice time for 30 days in a choice of 18'x18' rooms. Store your gear in a secure lockup at no extra charge. For use of larger studios, add $2/hour. For daytime access before 6pm, the rate is $25/hour and requires advance booking with deposit. Studio 0 is 26'x18' with 14' ceiling. 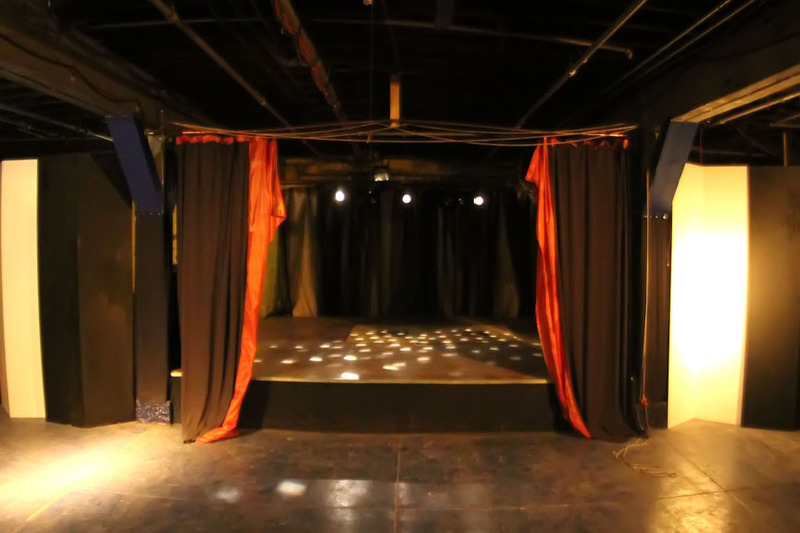 It features an isolation booth, electric organ, and lighting on dimmers. 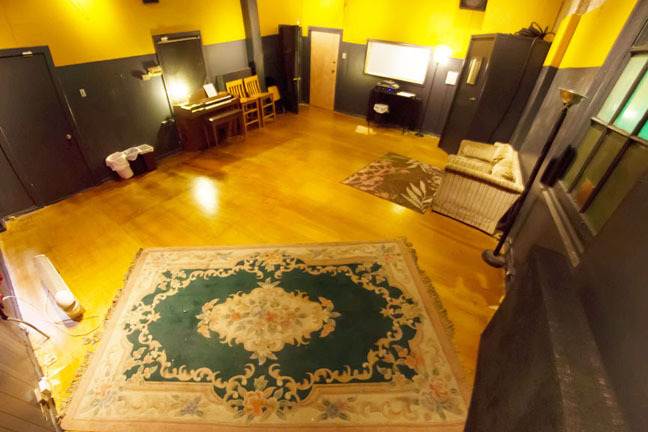 Studio 0 is available for rehearsal ($17/hour) or recording sessions with adjoining control booth and an engineer ($40/hour). Please see the recording page for recording info. 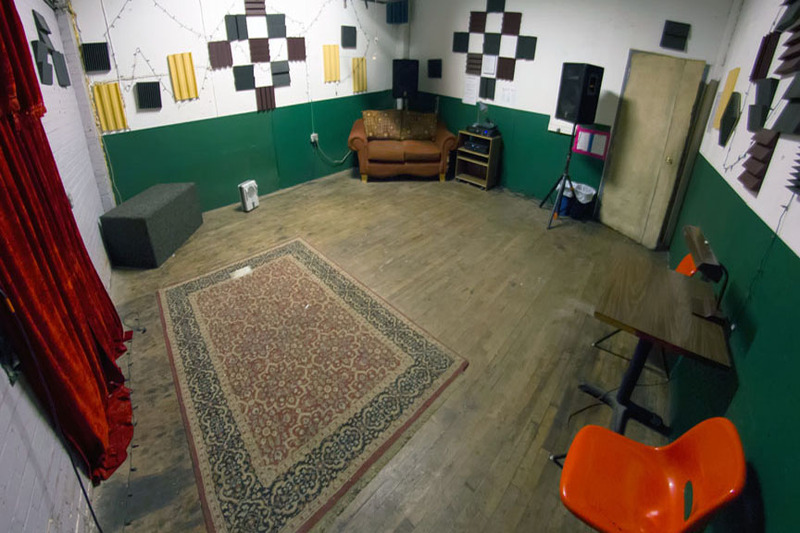 Studios 1 - 4 are what we refer to as our standard-sized rooms. Each studio is 18'x18' with a 14' ceiling. 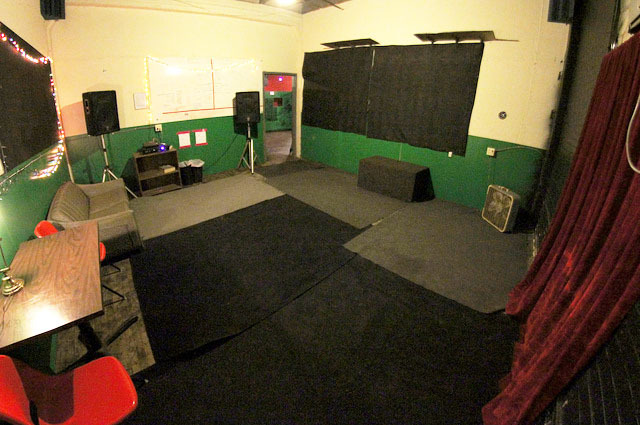 These rooms are available for rehearsals for $15/hour, or as part of a band membership for $175/month per group. 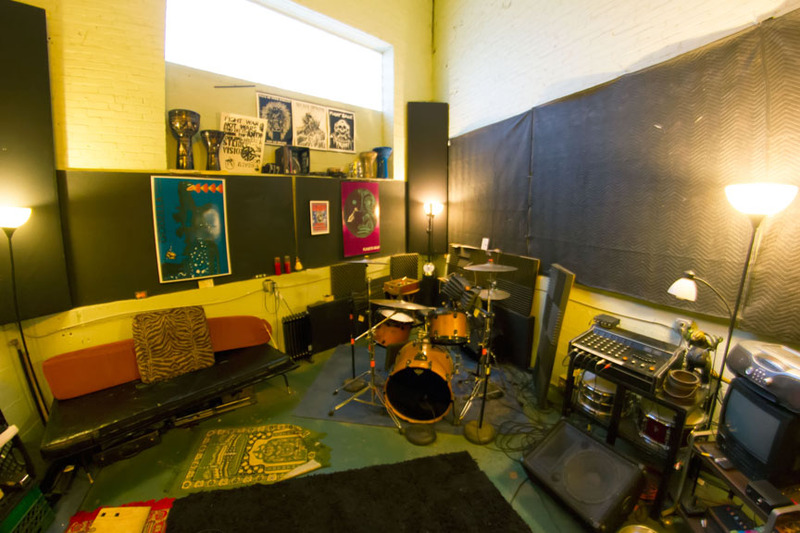 Soloists can use these rooms for $50/month. 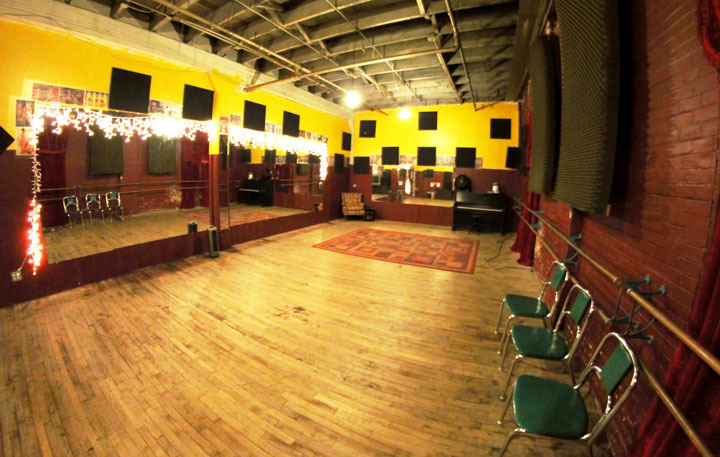 Studios 5 is a 650sq ft dance and music studio. It features hardwood floors, 2 mirrored walls, a ballet barre, and acoustic piano. This studio is available for $17/hour or $2/hour with a valid membership. Dimensions:34'x18'x14' ceiling. One-year lease on 18'x18' room= $275/month, 6-month lease = $300/month, or $350 for no lease. A security deposit equal to one month rent is required to reserve a private room, with first month due in advance on move-in. The deposit is refundable when you return the keys after giving 30-days notice prior to vacating the room. Please note that failure to give 30-days notice or complete term will result in forfeit of the deposit. 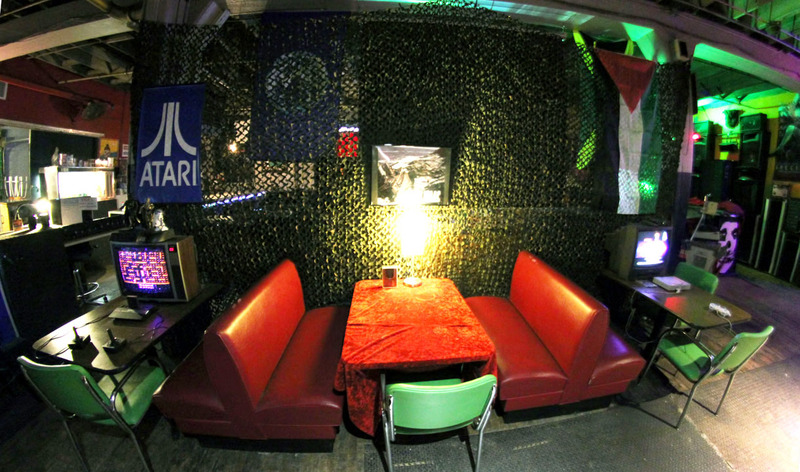 Private rooms can be as small as 6'x8' ($150/mo) or as large as 56'x56' ($1000/mo), pictured below. Our lounge is equipped with all kinds of games, seating for 60 guests, a digital projector with 80" screen, a hammock, bean bag chairs, and a bar. 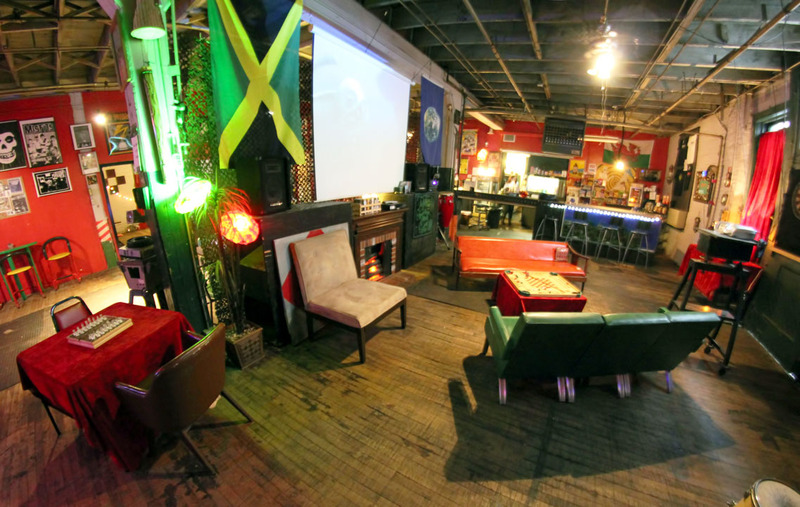 The lounge is a space you can come enjoy anytime between 6pm-2am, and is also available to rent for photo/video shoots, meetings, and workshops. Adjacent to the 3,000sq ft lounge is an outdoor courtyard as well as 2 soundstages available for video shoots and full-sound rehearsals with engineer. The main hall is ground level, with carts available to transport your gear. We have onsite storage lockups, rental gear for session use, a full bar serving hot and cold drinks and snacks, and a convenience shop for incidentals like strings, sticks and batteries. BOOKINGS: Call 314.773.3660 or email info@utopiastl.com to book a session. Studio 0 PA: Seismic Audio LE-2000 power amp, Yamaha MG102 mixer, Peavey 15" full range speakers with horns. Vintage electric organ. Studio 1 PA: Seismic Audio LE-3000 power amp, Yamaha MG102 mixer, Yamaha 15" full range speakers with horns. Studio 2 PA: TOA P-1030D power amp, Yamaha MG102 mixer, JBL 15" full range speakers with horns. Studio 3 PA: QSC RMX850 power amp, Yamaha MG102 mixer, Seismic Audio 15" full range speakers with horns. Studio 4 PA: Carver PM420 power amp, Yamaha MG102 mixer, Peavey BR15" full range speakers with horns. Studio 5 PA: Carver PM420 power amp, Yamaha MG102 mixer, Sony standalone CD player with remote, Behringer 2x15" full range speakers with horns. Acoustic piano. Mirrors, ballet barre.